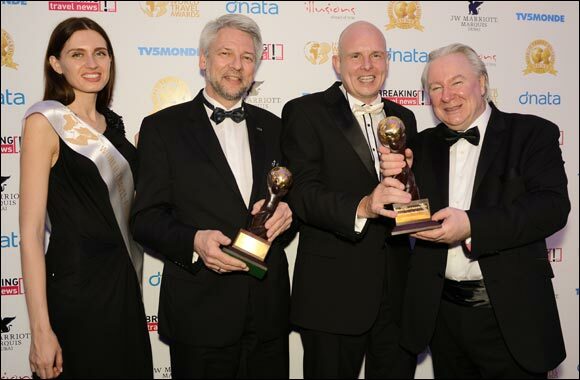 Sixt UAE has been conferred the prestigious World Travel Awards (WTA) for its quality Limousine Service across the Emirates of Abu Dhabi and Dubai. The exclusive mobility service has been awarded not once but twice in the ‘Leading Chauffeur Company’ category. Michael Schneider, Head of the Global Sixt Limousine Service, and Malcolm Cooper, General Manager of Sixt in Dubai, accepted the awards at a ceremony hosted by Graham Cooke, President of the WTA at the JW Marriott Marquis Hotel, Dubai. Recognized for the structure and quality of its chauffeur service, Sixt, represented in the UAE by Gargash Enterprises, is the leading provider of luxury chauffeured transportation in the UAE with its top-of-the range vehicles fleet, including Mercedes-Benz. With a far reaching presence across UAE, Sixt brings ease and convenience to car rentals by making available extensive range of services at special rates. In Dubai, the Sixt Limousine Service has been the official partner for the chauffeur service of the Omega Ladies Masters and the Omega Desert Classic golf tournament with its more than 200 golfers since 2010, including such well-known sport stars as Tiger Woods, Lee Westwood and Michelle Vee. Sixt also provides a chauffeur fleet with sometimes more than 100 vehicles for other events including the annual Formula 1 event in Abu Dhabi, the Air Show in Dubai. Established in 1993, World Travel Awards is now renowned worldwide as the ultimate hallmark of superiority and serves to acknowledge, reward, and celebrate excellence across all sectors of the global travel and tourism industry. The Sixt Limousine Service has the perfect solution for every mobility need, whether discreetly from the airport to the hotel or in luxury to the ‘red carpet’ at a gala. Employing a fleet of 300 high-quality luxuriously equipped vehicles and specially trained drivers, SIXT believes in providing not just the best service but ensures an uncomplicated but sophisticated way of renting a limousine.